It is with a grieving soul that I reflect on what happened in Newtown, CT yesterday. Nothing but diabolical Evil would consider killing innocent children. 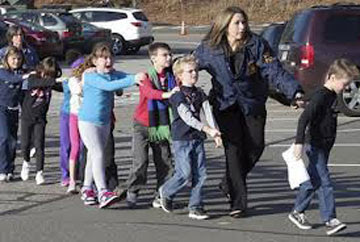 And Evil was in full force yesterday at Sandy Hook Elementary School. This is one of the challenges to our faith that shakes us to the core. It is simply impossible to understand. Facts are still unclear. There will be the obvious questions about what drove the gunman to kill family members, and then a school full of young children. Surely there were clues to this kind of madness, and who kept quiet? Between the recent mall shooting in Oregon and now, this tragedy in Connecticut, what is driving these young men to act out against innocent people in such displays of violence and death? We each need to ask ourselves what is responsible for such spiritual deadness and disconnection from other human beings? My own personal feelings are that removal of God from our schools, societies and families, has left our young people with an emptiness that leaves them feeling isolated. So don't ask, "Where was God?" when we have actively kicked Him out of our culture. When you then couple this with the near-reverance for violent video games that make inflicting violence against another person seem so easy and impersonal, perhaps it is easy to transfer that detachment to an actual person. Acting out their anger and feelings of loneliness become part of the "game". Many ask, "How could a loving God allow this to happen?" The truth is that He doesn't allow it. He has given us free will, which is another name for freedom. From the beginning of His creation, God gave us this freedom to choose love. Being All-Powerful, He could prevent any and all Evil, if He chose. But to prohibit all evil, means removing all freedom. This results in robotic human beings, who would then be unable to freely choose love. Therefore, the human race has the incredible capacity to be moral or not. To love or not. The young men in Oregon and Connecticut obviously chose not to feel love towards their fellow man, and made choices that devastated so many lives. So how can we possibly come to terms with what has happened in the last week or so? Once again the spotlight will be turned on the choice of weapons that the killers used in their reign of terror. But that focus is misguided. Our nation was brought to its knees in 2001 by box cutters, so legislating against these weapons of choice will not solve our soul-less society's problems. Instead, we need to grieve properly, and understand that every tear shed in these tragedies is shared by God, who lost His own Son to the inhumanity of man. And throughout the mind-numbing pain, we need to realize that Jesus is right there with us, because He has experienced the same. As we cry out in our pain, we remember Him on His knees in the Garden. Our tears are His tears. In the end, we have no answers as to why these tragedies occur, or how to prevent Evil and its aftermath. We can only offer our love and support to the victims. We can reach out to them and comfort them, as one human being to another, and offer a shoulder to cry on and a heart to share their grief. When the victims are innocent, beautiful children, the sadness is overwhelming. Heaven is weeping this day. Psalm 119:136 "Streams of tears flow from my eyes, for your law is not obeyed." wow. In a few words, you encapsulate it all very well. As a parent of 3 - my guts are simply wrenched for the parents of these kids - it is horrid. I agree with your discussion above as to the 'why' - we kick God out of places, this is what we get. 2. CT has some of the *MOST* stringent gun laws in the US - I've heard the 5th toughest - so I guess more gun laws (feel good legislation) will work now? 3. Research yourself - yet in Israel, teachers are issued semi-auto weapons - they don't have mass rampages in schools there. 4. "Gun free zones" such as schools are more like "kill at your leisure" zone - think about it. 5. Instead of banning 'guns' - since these happen frequently at schools - how about banning schools? I was talking to a friend the other day concerning the election and it's aftermath. I asked him if he saw since the election that bad behavior is much more the norm (note Jamie Foxx saying he got to kill whites in his movie, etc)... My friend noted that since the election that bad behavior appears now to be 'acceptable' . Rory, while I agree with everything you said, your last paragraph puts it all in perspective, doesn't it? All the laws in the land can't replace a personal relationship with Yeshua, our Lord and Savior. Thank you for this intelligent and heartfelt comment. I may sound crast or blunt, but I am deeply saddened by this event with these little children.What I noticed that truly bothered me on top of it all,was how the media swarmed these little children looking for a story. I also feel like the parents should have considered their child and should have not allowed this.If they wanted to talk about it, then I think it should have been with a parent or someone they trusted, not some stranger. Anything for a story. To me, by doing that, it just seems like it makes it "just another day", your moment of fame in the media. Some of the questions that they asked these little children were ridiculous. Why in the world, right after all this happened should these kids be put into that situation where they had to give more thought about this. I would say if anything they needed reassurance and comfort and when they were ready to talk about it, then the parent would be there for them with trying to explain to them what questions they would ask. Also, we need to stop making excuses for why these people are doing these kind of acts of aggression and killing. Yes, we should try to find out the "why's", to some degree, but, if we're all honest or asked to be honest, we all know what it is, and as Rory noted, God has removed his protection from us because we threw Him out the back and have gone on living our lives with no rules,everything is okay, live and let live, etc. We have lost our morals and respect for life in any form. As it was said, just look at all the abortions. Where do those children have a voice in their life and death. It goes very deep within all of us to ask ourselves, are we part of the problem? We need more people to be involved with raising their own children instead of letting some babysitter do it for us and be responsible for them and to society. Maybe the day will come where more people will feel that they can't feel comfortable letting their children attend a public school. Maybe families will have to team up and homeschool together in order to provide the protection their children are entitled to. Maybe we should quit spending taxpayers dollars on unnecessary things and put that money towards a better security system in these schools. Maybe they need to have more teachers or employees in the school who want to get their CCW's and extra training and let them do that,so they would provide them and their students with more security should the need arise. Guns don't kill as we all should know, people do and you're never going to change that and I think the more people who carry legally and have gone through schooling, the less chance that something of this size would happen, or at least without a fight. For crying out loud, these troubled people will use stones or a stick or use their bare hands if needed to accomplish what they want. The end is still the same. If I was a parent who had small children in school again, I would certainly vote for that to be implemented. People need to wake up and realize we're not living in a "Leave It To Beaver" family world and until the population says we've had enough and we're going to have to go about it in a different way, then this will continue to happen. People who have guns aren't nuts, it's the nuts who have guns that are a threat. You can take all the guns from the "good" folks, but you will always have the "bad" who will still be able to get what they want no matter what you or I or the government will do. My question to everyone...."Are you prepared to lose your child or grandchild, sister or brother to this sort of event" and what will you do to prevent it? Satan and his fallen angels are loose in the streets my friends and DANCING. Take heed. May the world have a change of heart and take our hearts back to Our God, and Our Savior. Until then, we will see this decline happen faster than any of us would have ever thought. My prayers go out to all and everyone who was affected by this tragedy. Satan is not only dancing, he is celebrating, because we are being misled by all the people who want to blame an inanimate object for doing evil. We have rejected God so many times and shoved Him out of our culture, that He has finally said, "You don't want Me? OK, I'll let you see what your world is like without me." Please, people! Turn back to God and ask His forgiveness! It is our only chance. Thanks again, Lisa, for a well-spoken comment. I also wanted to tell you about a website that I think would be helpful for parents to take a look at to help with questions and maybe helping their children protect themselves if anything like this would take place at their own school. This was on the prepper website and it is called....www.activeresponsetraining.net/parent-guide. This may be useful to some parents for future reference. Certainly something to consider as a parent and also to consider talking with those who oversee the school and the security. Thanks for this information. Check it out, parents!